O’Neill, T., Light, J., Pope, L. (2017, November). Effects of interventions that include aided AAC input on the communication of individuals with complex communication needs: A meta-analysis. Poster presentation at the Annual Conference of the American Speech-Language Hearing Association (ASHA), Los Angeles, CA. 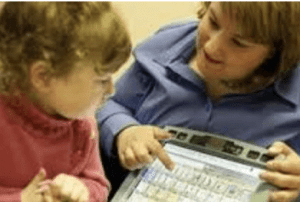 This meta-analysis investigated the effects of AAC interventions that included partner use of aided AAC (e.g., aided language stimulation, augmented input) on communication outcomes for individuals with developmental disabilities who use AAC. Interventions were found to be highly effective to improve both comprehension and expression across the domains of pragmatics, semantics, and morphosyntax for participants of various ages and diagnoses. Partners should utilize this strategy to enhance comprehension and expression for individuals who use AAC. As a result of aided AAC input interventions, individuals with developmental disabilities and complex communication needs can derive benefits in both expression and comprehension across language domains. The single case studies involved 88 participants. The mean effect size (Tau-U) was 0.83 (range= -0.18- 1.0), indicating a very large overall effect. Future research aims to explore the impact of factors associated with aided AAC input on communicative outcomes and to investigate methods to reduce demands of on partners implementing aided AAC input.